Alcohol and Crime research papers look into the long established relationship between alcohol and crime in history. The relationship between alcohol and crime has long been established. Paper Masters' writers are experts at documenting this relationship in research papers on alcohol and crime. Our writers focus on the statistics and sociological consequences of alcohol and how it relates to crime in America. The majority of incidents of domestic violence are connected to alcohol abuse. Abusive partners have a greater chance of acting violently after they have consumed alcohol. Alcohol is most closely associated with impulsive criminal acts. 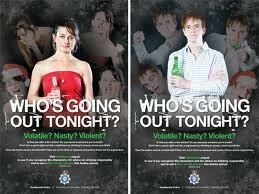 The most commonly reported crime in which alcohol is involved is simple assault. Crimes that are typically planned, robberies for example, are not as closely linked. Perpetrator intoxication does, however, increase the likelihood that a particular crime will turn violent or become more seriously violent. Research also shows that driving under the influence of alcohol is one of the most common crimes related to alcohol. It is probably more prevalent even than alcohol-fueled assault, though assault is more likely to be reported. Alcohol’s impairment of reaction time and judgment makes drunk driving particularly dangerous. Each year police across the nation make over one million arrests for people driving while over the legal limit for blood alcohol content. A large portion of traffic fatalities involve a drunk driver. A few decades ago this was true for the majority of road fatalities, but efforts to combat drunk driving have succeeded in reducing that statistic. Still, traffic accidents involving a driver who has been drinking are more likely to be serious than those that do not. Concerns about alcohol consumption at one time led to the failed national policy of Prohibition, which resulted in yet another kind of connection between alcohol and crime. Zero Tolerance term papers discuss the criminology term that imposes an automatic punishment for a rules violation. Order a research paper on Zero Tolerance from Paper Masters. Domestic Violence Research projects study the research done on this type of violence in order to find out how to stop domestic abuse. History of Domestic Violence research papers show how domestic violence has been documented throughout the ages. Underage Drinking Laws research papers examine the laws that are in place to regulate the drinking of minors. Paper Masters writes custom research papers on Alcohol and Crime and look into the long established relationship between alcohol and crime in history.